I guess it’s safe to say that most of us have seen, or at least heard of, Pixar’s movie ”Finding Nemo”. 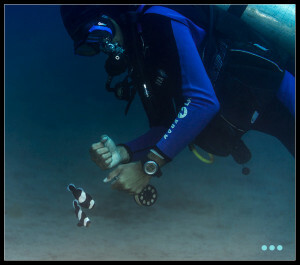 It tells about a young clownfish, which gets caught by divers to be sold as an aquarium fish. Daddy clownfish comes to the rescue and after countless threatening and funny adventures they are reunited and they live happily ever after. We tend to see these little orange fish as cute, harmless little … well, Nemos. But in fact, they are quite the opposite. Clownfish are members of the anemonefish family. There are a good amount of different species in the anemonefish, and they all display very similar behavior. Everyone thinks the clownfish is very cute, and the behavior shown in the movie “Finding Nemo” is only partly true. They are very cute, and they do swim in-out-in-out-in-out of sea anemones. And the cuties might even swim up to you if you’re snorkeling or diving above “their” anemone. The thing is, though, that this is not cute behavior. It’s defensive, territorial behavior. It may look cute, because they are small fish. 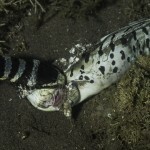 If you dive a lot in an area where anemonefish have their territory, chances are good that you have, or will be, head-bumped or nipped by an anemonefish. It’s their way of kindly informing you that you’re trespassing. Especially when there’s a batch of eggs, which is usually very near to the anemone they’re residing in, the adult anemonefish are extremely protective. And did you know that anemonefish actually have very sharp teeth? If you wouldn’t know any better, they could almost be family of the piranhas. It’s not something you typically notice, nor look for when you see a cute fish like that swimming with you and “playing” with you. Feisty and territorial as they are, they will try to get a hold of you if you don’t back up. Daddy clownfish in “Finding Nemo” was a bit of a coward in the beginning, but nearing the end of the movie he grew some “balls” and started displaying the usual behavior you find with anemonefish in the wild. Triggerfish are also very territorial fish. They will fiercely attack should you enter their territory. I’ve been attacked by both anemonefish and triggerfish. Luckily triggerfish I’ve always been able to keep at a distance, because they will bite a chunk out of you when given the opportunity. But now… cute as they are, those clownfish… Imagine them the size of triggerfish and imagine their behavior with what it really is that they’re doing when they approach you. Would you still think they are so cute? As you can see, size is everything, also underwater. 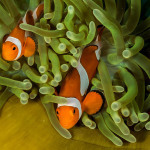 To repair that image you had in your head about the cute Nemos, you can always head over to the Reconnect Discover store and buy our Anemonefish e-book. It’s 116 pages of colorful Nemo cuteness!